We are thrilled to announce the second annual John Henry and Friends benefit to support New York City’s Keswell school, an educational program for children and young adults with Autism. The second annual benefit features Graham Nash, Shawn Colvin ,and Steve Earle & The Dukes celebrating the 30th anniversary of Guitar Town which will be played in its entirety. There will once again be a rehearsal show at City Winery on December 4th, and the benefit will be December 5th at Town Hall. More details at link below, as well as info on Special VIP packages. We are excited to announce Steve will be joining Lampedusa: Concerts for Refugees this October to raise awareness and money for refugees. The tour will also include Emmylou Harris, Patty Griffin, Buddy Miller, The Milk Carton Kids and more. Grab your tickets below. "COLVIN & EARLE" Out Now! Exclusive Colvin & Earle 7" "Wake Up Little Susie" available tomorrow for Record Store Day. Limited to 2000 copies. We are thrilled to announce COLVIN & EARLE, the duo debut album of Shawn Colvin & Steve Earle, in stores everywhere June 10th, 2016. The first single, "You're Right (I'm Wrong)", premieres on Rolling Stone today. Check it out here. We’re excited to announce that Steve will be hosting a 3rd annual Camp Copperhead in 2016! Next year's event will be held at the beautiful Full Moon Resort in Big Indian, NY from June 27th-July 1st. This songwriting event will take a deep look at how songs are composed and constructed through the lens of Steve's catalog. He'll be sharing the stories and inspiration behind much of his music. The difference between this year and past years will be the focus on "choices". The choices that you make about technique while songwriting will be a large part of the curriculum. You'll also have the choice to work with a poet, prose writer, or guitar teacher each afternoon so that you can curate your own experience based on what you'd like to work on most! As always, there will be an open mic each night and on the last night a performance by Steve. "I hope you make the choice to come and join us. There’s a community that’s been formed amongst previous attendees. Everybody keeps in touch online and says hello at the shows. Most importantly though, I want you to learn more about my songs and maybe even your own in the process. The songs are everything, and that’s even why the program gets its name from my song 'Copperhead Road.' "
Everyone who signs up before Christmas will receive a signed free copy of Steve’s novel “I’ll Never Get Out of This World Alive”. 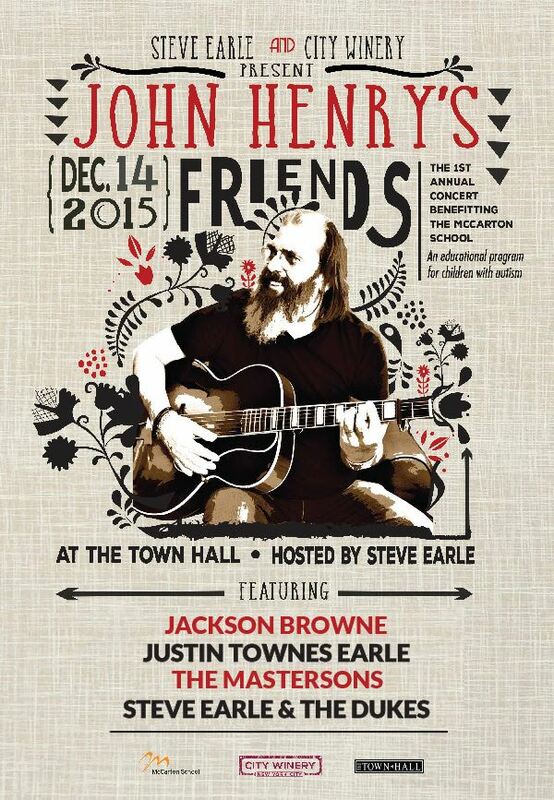 Steve Earle & City Winery Present John Henry's Friends feat. Steve Earle & The Dukes, Jackson Browne, Justin Townes Earle and The Mastersons on Monday, December 14th. Steve’s excited to for his Winter Residency at City Winery. These shows will be Steve solo and acoustic with special guests to be announced. Dates and ticket links below. Dates and ticket links below.